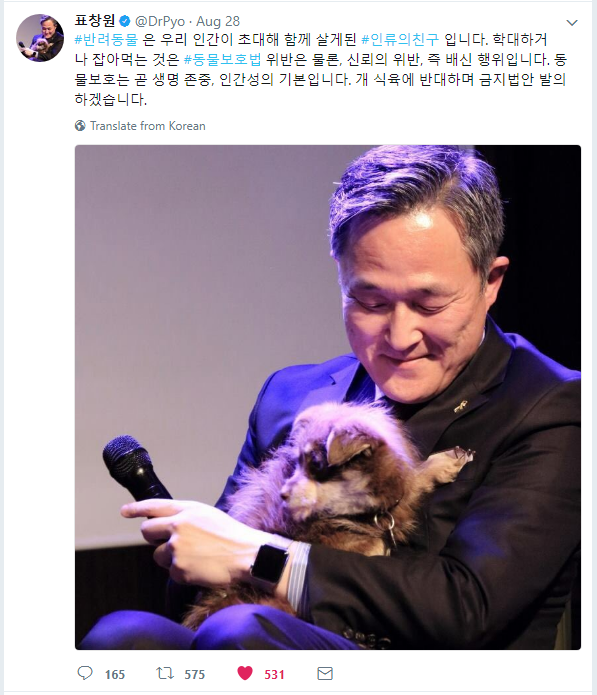 Daum news reported on August 28 that National Assemblyman Dr. Pyo Changwon of the Minjoo (Democratic) Party expressed his opposition to dog meat consumption. On May 28, through social media, Dr. Pyo stated that he will continue his legislative effort to illegalize the dog meat industry. On August 31, 2016, he presented a proposal to amend the Animal Protection Law. The proposed amendment contains provisions to reinforce punishment for animal cruelty; allow anyone to rescue abused animals; suspend the license of any business committing animal abuse; confiscate animals; and restrict animal ownership by animal abusers. 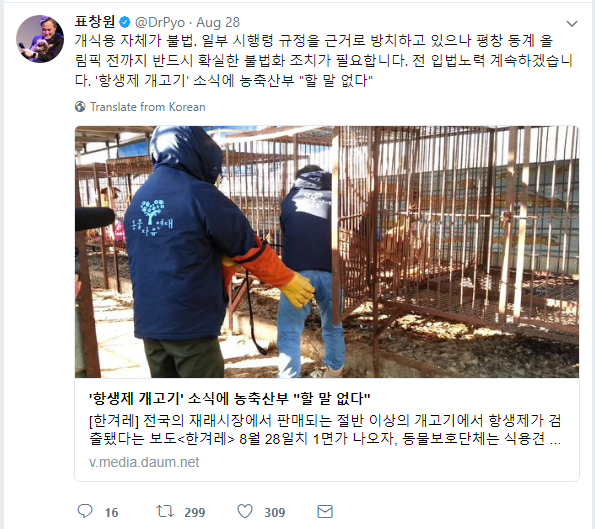 Dr. Pyo has undertaken a difficult battle to save Korean dogs from horrific cruelty and keep Korea’s image from being further tarnished. There will be backlash from dog meat consumers and the dog meat industry in an attempt to preserve their livelihood. Please keep the pressure on South Korea. Let’s make this happen! Sign the Petition to support Dr. Pyo. I would like to let you know that Ms.Gill Aaronjot from City of Surrey,Brithish Columbia, send me an e-mail five days ago in which she states that Mayor Hepner will be terminating the friendship city agreement with Dongjak and that they have contacted the Mayor of Dongjak to ensure they understand that their agreement has been terminated.We should thank Mayor Hepner for her sensitive decision! No one deserve to be treated this way. I have 3 dogs, everytime i look at those happy eyes, i see those who are crying of suffering, agony, desespair, alone with no one to protect them. All animals have the right to live in this world. At last !!! only one word !!! Bravo !!! Thank you Dr Pyo Changwon !!! You have the courage to join us in this great, global battle to rescue dogs and cats from Korean Hell !!! I know that there are many Korean citizens who are against this horrible trade but we need people like you to help us !!!! Oh, thank you from the heart, keep it up! Press on Dr. PYO, you’ll be a HEROE for millions of people who are waiting for THE END of dogs and cats meat trade ! The World Loves Our Companion Pets! The Words You Expressed Give Us Hope That This Horrific Practice Will End! Everyday Life for These Dogs and Cats is He’ll on Earth! There is No End in Sight Until You Spoke Such Encouraging Words! I Can Tell You How Much Relief It Gives to Know That This Abomination Will End Soon! Thanks From the World Over!!! Great news! A glimpse of hope! Thank you, Dr Pyo! Best news ever! Dogs and Cats are our very best friends and family! NOT FOOD!! !